Entertaining performances can be seen at Landmark on Main Street in Port Washington. 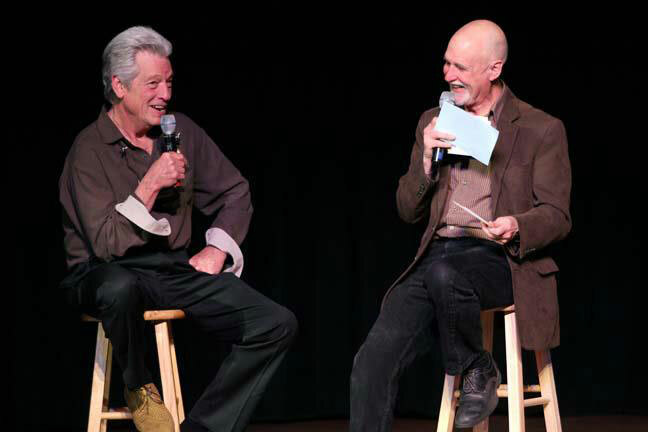 Pictured are Blues Legend John Hammond and Radio Host John Platt. Photo by Steven Sandick via Landmark on Main Street. While there's plenty to do during the day at the beautiful waterfront village of Port Washington, by night, the action really begins! From happy hours, dancing, evening shows, a late-night movie to a fun night dining out, Port Washington's bars, pubs, clubs, and nightlife events offers it all! One of the more notable places to visit in Port Washington for evening entertainment is Landmark on Main Street. This property was originally a school, but today it's a historic landmark and an important part of Port Washington's community. It continues to host concerts, shows, competitions, dance performances, and other entertaining performances utilizing its 425-seat theater, gymnasium and meeting rooms. The venue's roster of performers have included Jon Batiste, Rosanne Cash, Lou Gramm, and many others. Port Washington is a hub filled with nightlife fun and adventure to be explored! Not only a local historical landmark, Landmark on Main Street offers the community lively entertainment at the Jeanne Rimsky Theater! Enjoy a friendly atmosphere at this dance and supper club on waterfront near Manhasset Bay!